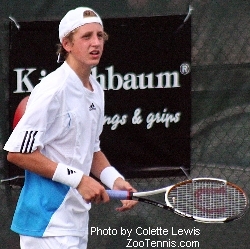 Not too far from that ladder of tennis achievements rests Boys’ 16s #1 seeded player, Tennys Sandgren (Gallatin, TN) -- pictured right. He showed all too powerful for his opponents all throughout the USTA Boys' 18 & 16 Clay Court National Championships hosted by the City of Delray Beach. His depth and flat-hitting pace, along with the #1 seeded status on his tennis ballot, seemed to his opponents greatly intimidating and impenetrable. Sandgren was up against Denis Kudla (17) (Arlington, VA). Sunday morning for the attainment of the Gold Ball and for the acclamation of the ultimate birthday gift. In a 6-4,6-4 defeat over Kudla, Sandgren had a lot to celebrate. As a strong-minded, tenaciously determined, and wickedly talented player, we’d like to award you, Tennys Sandgren as our appropriate Boys’ 16 Day 8 Player of the Day and Player of the Tournament. And like “Tennis” Sandgren, National Finalist “Dennis” Kudla is not one to ignore—cool Kudla is certainly dissatisfied with silver and itching for the Gold. We salute you Denis “the Menace” Kudla, and wish you all the best on your golden journey apart of that ‘Virginia Company’! As was aforementioned in previous articles, "upsets" are not absolutions. That which is certain in tennis is this: There will be one winner and one loser. Bam! The mark of a champion, however, is dependent upon how he handles himself as the "lead dog" or as an "underdog"—will he crumble under the pressure of failure or rise to the challenge of success? Today, out of 192 players in the country in the Boys’ 18s division, Clint Bowles (Tampa, FL) -- pictured right -- finished ahead of the savage pack. Up against Bradley Klahn (6) (Poway, CA), those who may not have known the unseeded Bowles might have thought he’d submit to his status as an unachieving unseed. However, according to Clint, “spectators may have thought I might have come out of nowhere and would not win, but I know these guys in the draw, and I don’t think I surprised them too much.” With serves double the speed of interstate traffic, Bowles captured the prodigious title in a mere 44 minutes, and with it, the Gold Ball, defeating Cali’s Klahn, 6-4, 6-4. If Golden Bowles can ‘floor it’ all the way through Delray in less than an hour, we can certainly take a minute and answer this itching question: “Why the heck wasn’t he seeded?” To answer in short, Clint’s recent competitions include the likes of the Junior US Open, Junior French, and Junior Wimbledon—earning him a ranking as high as #28 in the ITF junior world rankings in addition to his four ATP points garnered as he got his feet wet on the pro tour. While this was great for his tennis résumé, Bowles’ time spent away from the ‘junior pool’ left him short of the “floaties” to keep him highly ranked and chadded for National seeding. With his second ‘National Champion’ title and Gold Ball in hand, Clint will begin his journey as he tribal dances to Florida State in fall 2007. Having finalized his junior legacy he will now concentrate on adding further gold to his collection…“garnet and gold”. It can be argued that even if you're not the lead dog, and the scenery is looking not-so-scenic, don't give up…there is always more than one dog chasing the bone. So we say to you Clint "Owner of Many Gold" Bowles, you certainly played Maximum Tennis today and throughout the entire tournament, and we're confident that you still have more room to unleash your on-court potential (*wink wink*, author and coach, Nick Saviano). Therefore, with greatest pleasure and highest hopes for your future pro tour and "seminal" success, we'd like to award you as our Day 8 Boys' 18 Player of the Day, Player of the USTA Boys' 18 Clay Court National Championships, AND Wildcard recipient into the main draw of the Delray Beach International Tennis Championships (ITC). We’ll see you in February '08 for Delray’s ITC. For additional information, including future volunteering and sponsorship opportunities, please call the tournament office at (561) 330-6000. Also look for stories & photos on Zoo Tennis.